Bulbasaur, Squirtle, Charmander: which is the best starter Pokemon? July 21, 2016, 9:56 a.m.
A generation&apos;s most important question has now been answered. Which is the best of the first generation starter Pokemon: Bulbasaur, Charmander or Squirtle? 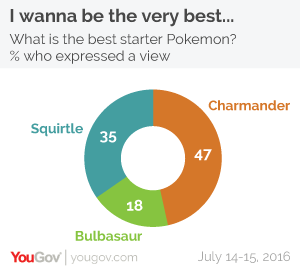 We are delighted to be able to reveal that the answer, according our new survey, is Charmander. The inexplicably alight salamander was the favoured Pokemon of 47% of those expressing a preference. Squirtle came second on 35% leaving Bulbasaur a distant third with 18%, despite its type advantages at the beginning of the original games. It is unclear how the introduction of lightning mouse Pikachu - the starter pocket monster in Pokemon Yellow - would change the results. The Pokemon franchise is undergoing a revival with the release earlier in the month of Pokemon Go, a new augmented reality smartphone game that allows players to wander the real world catching Pokemon. Overall 8% of GB adults had downloaded the app by Friday last week, with a further 11% saying they were considering downloading it in the future. Pokemon is of course much more familiar to millennials, and breaking those figures down by age shows that 24% of 18-24 year olds have already downloaded the game, with a further 27% considering it. This compares with a statistical 0% of 65+ year olds having downloaded the game, although an adventurous 2% are considering it. The app has had its fair share of controversy, with careless players putting themselves in harm’s way by wandering into other people, roads, caves and even minefields. 43% of people agreed that Pokemon Go is a danger for road traffic, with just 12% disagreeing. The app has had more positive side effects. 41% of people felt that Pokemon Go is leading to people coming into contact with strangers, and indeed the internet is awash with stories of how strangers who have met whilst playing the are bonding over their shared enjoyment of the game. A further 34% of people agreed that the app was helping to get people to be more active. People dispute, however, claims that Pokemon Go helps improve concentration, with just 10% agreeing that the game improved concentration against 32% disagreeing.